What are the big goals behind your creative business? Are you working towards them a little each week? Or do you tend to work around them, unsure of how to reach your far-away dreams? Whether you’re just starting out or have been in business for a while, establishing overarching goals is essential for a thriving handmade shop, and your every move should lean towards attaining them. But sometimes those big achievements seem so far away. How do you approach them when they loom over you like giant mountains? Today, I'm sharing a simple method to make those big dreams more approachable. I made a handy workbook to help you along. It's 5 pages long and includes guided questions and space to write your answers to help you through the process. You can get your free copy below! When January rolls around, it’s easy to feel a bit discouraged after the exciting wave of holiday sales. But the slower season is a valuable time of year for your business, too. With fewer sales to keep up with, you can work on the heart of your business to make it stronger and more fruitful. So instead of staring at your stats and wondering where the eager shoppers went, take advantage of the extra time to tackle some important behind-the-scenes shop tasks. 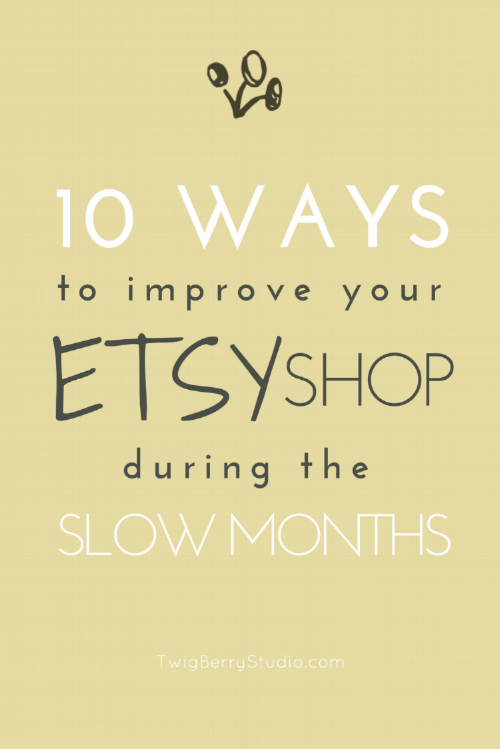 Get a head-start on 2017 with 10 ways to improve your Etsy store after the holiday rush. Like what you're seeing on the blog? Sign up for the TwigBerryStudio Newsletter for exclusive content.